A drug which could stave off lung cancer for up to five years after diagnosis and even cure it will be funded by the NHS. The health service’s drug regulator today announced Imfinzi would be available for free to patients with stage three non-small cell lung cancer. Experts said the approval is ‘fantastic news’ for patients and believe it could benefit as many as 500 people every year. An immunotherapy drug, Imfinzi is part of a growing field of medicine which utilises a patient’s own immune system to fight back and destroy cancer cells. The announcement has been hailed as a ‘watershed moment’ after years of stagnation. The National Institute for Health and Care Excellence (NICE) said the ‘promising’ new treatment, known as durvalumab, will be made available immediately through the NHS Cancer Drugs Fund. 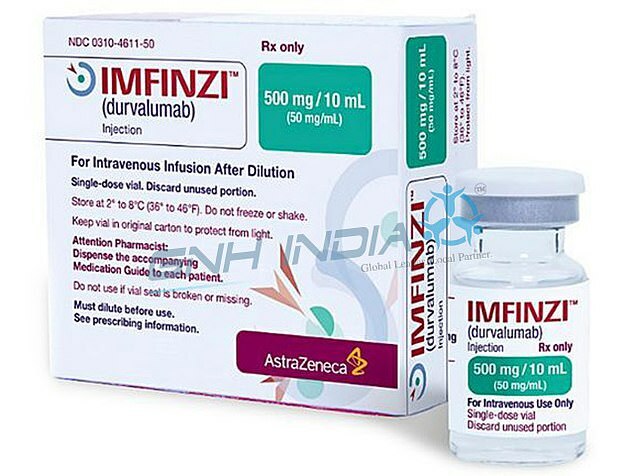 Made by AstraZeneca, a company worth £80.5billion, Imfinzi will be offered to the NHS at a discounted price. NICE expects it could benefit around 165 people in England in its first year, and hundreds more in the future. ‘This decision marks the biggest advance we’ve seen for a number of years in treating locally advanced non-small cell lung cancer,’ said Dr Fiona McDonald, an oncologist at the Royal Marsden NHS Foundation Trust in London and adviser to NICE. ‘For our patients, it’s fantastic news. I expect to see an immediate impact on clinical practice, and for this treatment to become the standard of care for eligible patients. The drug is for patients suffering from locally advanced non-small cell lung cancer (stage three) which cannot be removed with surgery. Patients must have already tried chemo and radiotherapy before they will be eligible for the Imfinzi. The drug is known as a PD-L1 inhibitor and works by helping the body’s own immune system find, fight and kill cancer cells. In a clinical trial, patients on the drug had an average of around two years without their disease getting worse, compared with six months for those not on the drug. WHAT IS NON-SMALL CELL LUNG CANCER? Non-small cell lung cancer (NSCLC) is the most common form of the disease (80 per cent of cases) and includes three specific types of tumours. It includes adenocarcinomas, squamous cell carcinomas, and not otherwise specified types of NSCLC. Adenocarcinoma is cancer which develops from mucus-producing cells in the airways. This is the most common form of NSCLC and accounts for around 30 per cent of all lung cancers. Squamous cell carcinoma develops in the flat cells which line the airways. Not otherwise specified types of the cancer are when doctors cannot be certain what type of lung cancer the patient has, but this is uncommon. Nice said between 27 per cent and 40 per cent of people taking durvalumab could have five years without their disease progressing. In some cases, the drug may provide a cure, though more clinical trial data is needed, it added. The drug will now be further evaluated on its effectiveness. Meindert Boysen, director of the Centre for Health Technology Evaluation at Nice, said: ‘We are pleased to make this exciting new option available and look forward to seeing further data on the effectiveness of durvalumab. Corinne Faivre-Finn, an oncology professor at the University of Manchester, said: ‘The availability of durvalumab is a watershed moment for lung cancer in England as it will change how we treat patients with stage 3 disease. ‘Stage three non-small cell lung cancer is potentially curable but unfortunately with current treatments most patients will progress to advanced disease. Professor Charlie Swanton, Cancer Research UK’s chief clinician and lung cancer expert, said around 300 to 500 people per year could be eligible for the drug. Durvalumab is given by injection every two weeks and its list price is £2,466 for a 500mg vial, although it will be cheaper for the NHS. Professor Swanton said: ‘Durvalumab is a kind of drug called an immune checkpoint inhibitor, which works by reawakening immune cells in the tumour so that they can recognise and attack mutated proteins on the surface of lung cancer cells. ‘Stage three non-small cell lung cancer accounts for approximately 20 per cent of new lung cancer diagnoses each year.